Manifestations of the main types of metasomatites (beresite, propylite, listwaenite, aceite, and gumbeite) were identified in the shear zones of the Fenno-Karelian craton on the basis of the previously proposed systematics of metasomatic facies. These metasomatites were formed in shear stress environments, which determined their morphological features, in particular, finely banded texture. Comparatively low-temperature conditions of infiltration process and salting out effect (reduction of CO2 solubility with increasing salt content) lead to the heterogenization of fluid into two phases: aqueous salt solution and almost pure CO2. This results in more aggressive and mobile behavior of the fluid, and, correspondingly, more intense differentiation of the matter and contrast in metasomatic banding. Relations between metasomatic parageneses indicate an evolution trend of the processes from propylite, beresite and listwaenite to alkaline varieties and their repeated manifestation in the same shear zones. The results of Rb-Sr isochron dating of ore metasomatites from eight deposits and occurrences of the Fenno-Karelian craton (more than 100 samples of rocks and minerals) confirm previous assumptions. In general obtained data show that the shear zones controlling the distribution of the studied occurrences operated as fluid pathways during a long time period, up to 200 Ma, after the Svecofennian orogeny completion and did not show any correlation with Paleoproterozoic and Neoarchean magmatism. Rb-Sr isotope data on the metasomatites indicate three peaks of the post-Svecofennian metallogenic activity: 1700–1780, 1600–1650, and 1400–1500 Ma. Since the studied ore deposits were formed within tectonic structures, which evolved on the Archean crust and have a long prehistory, and fluid flows were subjected to intensive contamination by ancient crustal material, a relatively high initial Sr isotope ratios of formed ore-metasomatic systems were developed. High variablity of this value in the studied rocks ((87Sr/86Sr)0 from 0.706 to 0.750) is related to the heterogeneity of crustal protolith and to the relative storage and manifestation of the juvenile component of the fluid, which was responsible for the metasomatic transformation of the Archean and Paleoproterozoic rocks and ore-deposit formation. Original Russian Text © V.A. Glebovitskii, S.A. Bushmin, B.V. Belyatsky, E.S. Bogomolov, A.P. Borozdin, E.V. Savva, Yu.M. 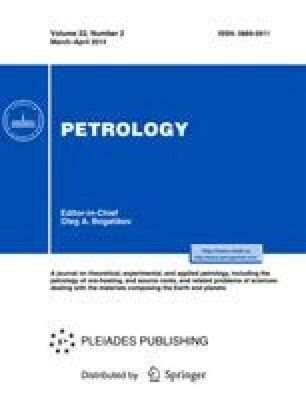 Lebedeva, 2014, published in Petrologiya, 2014, Vol. 22, No. 2, pp. 208–232.